It is highly shocking to know that reputed Religare Online site is listed by Google as as suspicious (means visiting this web site may harm your computer). I got the following error message from google. What is the current listing status for www.religareonline.com/? Of the 1668 pages we tested on the site over the past 90 days, 204 page(s) resulted in malicious software being downloaded and installed without user consent. The last time Google visited this site was on 09/13/2008, and the last time suspicious content was found on this site was on 09/13/2008.Malicious software includes 320 scripting exploit(s). Successful infection resulted in an average of 2 new processes on the target machine. 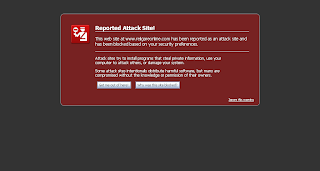 Malicious software is hosted on 31 domain(s), including adpzo.com, cdport.eu, ncwc.ru. 2 domain(s) appear to be functioning as intermediaries for distributing malware to visitors of this site, including cdport.eu, adpzo.com. Over the past 90 days, www.religareonline.com/ did not appear to function as an intermediary for the infection of any sites.